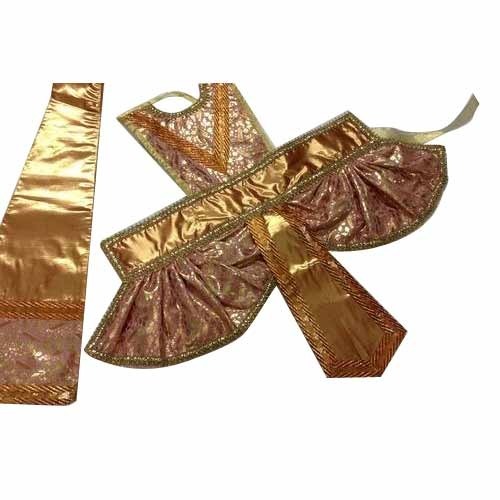 We are a noteworthy manufacturer and supplier of a comprehensive range of excellent quality Hanuman Ji Dress. These are designed by our highly skilled professionals using high grade fabric and latest technology in compliance with the international quality standards. To ensure their quality and durability, these products are stringently tested against various set industry parameters. Moreover, our valued clients can avail these products in various sizes, colors and patterns. Originated in the year 2004, at Indore (Madhya Pradesh, India), we, “Sakhi Creations”, are occupied in manufacturing and supplying the finest quality assortment of Artistic Name Plate, Artistic Shield, Charan Paduka, God Chhatra, Decoration Accessories, Designer Mandir, Designer Saree, God Dress, Ethnic Cushion & Pillow, Glass Mandir, etc. These products are designed using high-grade basic material and advanced technology at out sophisticated manufacturing unit. We are offering our extensive range of products, as per the various requirements of the customers. These products are known for their corrosion resistance, scratch proof nature, attractive look, exclusive pattern and long life. As a client centric organization, we are making tireless efforts to satisfy the various requirements and expectations of our customers.